Do You Remember... "Jefferson Drum"
Jefferson Drum (Jeff Richards) arrived in the small town of Jubilee with his young son Joey (Eugene Martin) planning to book passage to San Francisco. Embittered over the loss of his wife, who was murdered, and the loss of his newspaper, Drum is looking to start life again in a new locale. But, in the first episode, “Arrival” (which was actually initially broadcast as the final episode of NBC’s “The Web” on 10/6/57 as “Man With a Choice”), when he encounters a local gunfighter who has murdered the publisher of Jubilee’s newspaper, Drum decides to stay and fight him—and other injustices. Based on characters created by Walter B. Newman, the half-hour, black and white frontier journalism series “Jefferson Drum” was set in the 1850s as Drum took over THE STAR in Jubilee, a wide open western gold mining town. The producer was Matthew Rapf. Usual writer was E. Jack Neuman with most episodes directed by Harmon Jones. Although Drum believed the pen was mightier than the sword, and he was certainly adept with a Colt or his fists when need be, Drum preferred to fight lawless elements with editorial words. Besides his son, Drum was aided by noted character actor Cyril Delevanti as Lucius Coin, his printer, and Robert J. Stevenson as friendly bartender, Big Ed. “Jefferson Drum” was a midseason replacement for the failing “Court of Last Resort” on NBC’s Friday night lineup as of April 25, 1958. 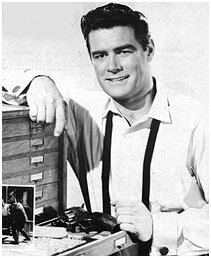 The Goodson-Todman series produced through Screen Gems never really had a chance with NBC programming it up against two already established 8pm (EST) western series, “Trackdown” on CBS (started in ‘57) and “Jim Bowie” (began in ‘56). After 14 episodes, NBC moved “Drum” up a half hour to 7:30 (Eastern) where it simply was in worse competition opposite “Rin Tin Tin” on ABC and “Trouble With Father” on CBS. In a last ditch effort, in November NBC tried “Drum” at 7:30 on Thursday as counter-programming to CBS’ powerhouse “I Love Lucy”. By December 11, 1958, after 26 episodes, originals ceased, and the timeslot was filled with repeats until April ‘59. Born Richard Mansfield Taylor in Portland, OR, on November 1, 1924, Jeff Richards was an outstanding baseball player in high school in Tacoma, WA, a likely prospect for the major leagues. WWII and Navy duty in ‘43 temporarily interrupted his plans. But in May ‘46 he was signed by the Portland, OR, Beavers and farmed out to the Salem Senators. After only two weeks play, he was sidelined for a year with a torn leg ligament. At that point he decided to try his luck in Hollywood. He played bits for a while, then was signed by MGM in ‘50 where “Seven Brides For Seven Brothers” was his big chance at stardom in ‘54. But the rugged Richards, realizing he couldn’t dance, apparently abhorred musicals. MGM dropped Richards in ‘57. It was then he signed on for “Jefferson Drum”. After it failed to click, Richards sought solace in alcohol and only appeared in a few lowbudget quickies in ‘59 and ‘60. 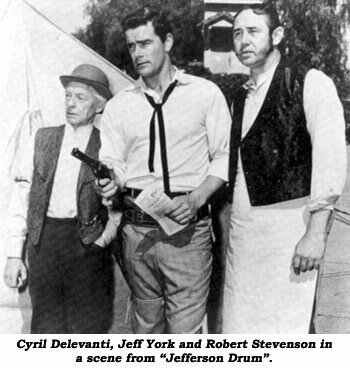 Even TV afforded him few parts, with roles on a “Laramie” in ‘60 and a “Rawhide” in ‘61 being his last. Producer A. C. Lyles used him in “Waco” (‘66) but otherwise Richards became a carpenter working construction at Hollywood studios. In later life he lived in Hesperia, CA, and died at Victor Valley Community Hospital in Victorville, CA, of acute respiratory failure due to pneumonia on July 28, 1989. He was 64. Child actor Eugene Martin worked from ‘56-‘76 but has not been heard from since. Cyril Delavanti died at 88 December 13, 1975, of lung cancer. Robert J. Stevenson died at 60 on March 4, 1975, of cardiac arrest.